SERPENT LORD formed about two years ago and despite their short tenor they seem to have everything it takes to “make things happen”. With nothing but an EP, the band gained momentum after opening for OMEN and GRAND MAGUS in 2017 and didn’t stop working hard ever since. This brought us to today and to the release of “Towards the Damned”, the band’s debut and subject of this review. Describing themselves as an occult band, they managed to trick me into thinking they are of these cookie-cutter occult rock bands that are all about the imagery. Fortunately though, their proved to be a lot more than that. I’d describe their music as an alloy of heavy metal with influences from almost every other metal genre, from black/death to progressive and epic doom metal. In real life this translates to bands from DEATH and ANNIHILATOR to CANDLEMASS, THERION, MOONSPELL and MY DYING BRIDE, and everything in between. Most of the record is dominated by driving, mid-tempo songs that reminded me a lot of MERCYFUL FATE when it comes to songwriting, which can’t be a bad thing, right? Being the birth-child of an occult metal band, “Towards the Damned” couldn’t sound anything but grim and sinister. In comparison to the majority of occult bands out there, SERPENT LORD seem to draw most of their inspiration from Christianity and Greek mythology rather than generic “evil stuff”, so if you’re a lyrics guy like me, you might find it easier to relate to their music. I believe it’s also worth mentioning that the album cover is an adoption of “The Destruction of Sodom And Gomorrah” by the English painter John Martin. Moving on to the actual tracks, things went pretty smooth during the first spin and I was able to distinguished quite a few songs, starting with “The Lesser Key” which set the record straight: dark, powerful riffage with lots of changes in the mood and memorable melodic guitar solos. Following next is the “Ambassador of the New Age”, a nice throwback to ICED EARTH’s Barlow era, mostly due to the opening galloping riffs and vocal lines that hold a resemblance to “The Dark Saga” album. “Nephelim” is the first song where the band throws in some doom metal elements in the vein of CANDLEMASS. My favourite would be “Evvuio Oitovo Iman”, a song written in a language I don’t understand, that got me hooked due to its ominous aura and strong ROTTING CHRIST vibe, while the narrative parts and choir-like choruses really make it sound unique. None of the song in the album gets past the five minute mark and I’d dare to say you won’t find any fillers either, as each song holds a “personality” of its own. As with all things in life, nothing is 100% perfect and “Towards the Damned” does not escape the rule. One thing that [IMHO] could be improved – and do not consider this a deal breaker – are the vocals and by that I don’t no mean they are bad. It’s just that I spotted a few parts where they sounded a bit weaker or more predictable than I anticipated, thus taking away some of the “magic” the rest of the music had built up ‘till that point. My gut tells me they will get better at this, given they’re young blood and still have a long way ahead of them. 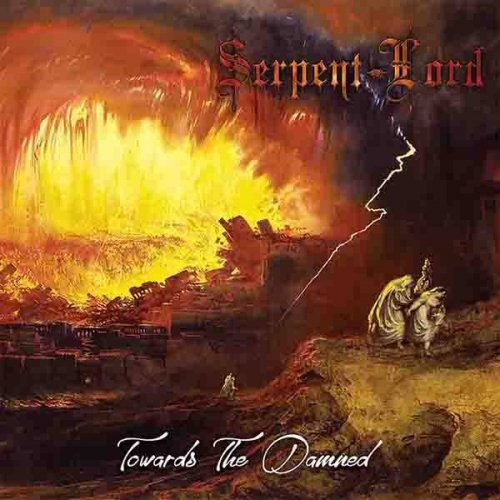 To sum it up, SERPENT LORD’s “Towards the Damned” is a great first step for the band and an overall well-crafted album, that sets the stage for everything to follow. If you’re a fan of the bands mentioned earlier you might not want to pass on this. We are thinking a lot about death, love, religion, about God, everything related to metaphysical, so we use an interesting story as a cell, so as to talk about our feelings.